I just had my first experience coaching in a tournament this weekend. It was pretty interesting to say the least. I started girlsCAN over ten years ago, and this was the first time that we’ve actually put together teams and taken them to tournaments. This whole time I’ve been doing camps, clinics and my showcase. What I’m loving about the experience is implementing ideals on a group of girls that reflect how as elite female players, we believe a team environment should be, and the enforcing the kind of standard that we believe needs to be set to be successful. As an elite athlete you realize so much of success is built on attention to details and discipline as well as an appreciation for professionalism. For the first couple of weeks we have had these girls (who are between 7-14), we have instilled in our program a culture of high expectations. And this is before the girls even touch the ball. When a coach calls the girls in, they are expected to run. The last one gets down and does 5 push-ups. When their coach is talking to them, their arms are by their side. Not crossed, not over their head. They stand arms by their sides and eyes focused on their coach. Their bags are lined up in a straight line. If they have a problem with anything, they are expected to come to us, not go through their parents (yes even the 7 year olds). And they all have journals that are randomly inspected that they are expected to track their daily progress. And funnily enough, as many of the girls have communicated to us and to their parents, they like how strict we are with them. I believe people inherently love to be held to a high standard. It’s how you reach your best. And it shows care to enforce that standard. So at the beginning of the summer we had a parent meeting and also set a high standard with our expectations for parental behaviour. By coming to our program, they were having their daughters coached by players who have played at the highest levels in the world for women’s soccer. We told them we expected them to respect our experience and not question our decisions. We told them that we would always welcome a conversation with their daughters, but we were not going to be having soccer-related discussions with them. We would not be engaging in any kind of social media with the parents or players also, so no, none of us would be facebook friends. We were passionate about giving their daughters an incredible experience that would make them better players and people and we wanted them to be allies in the process. We assured them that we’ve been in enough bad environments as players, that we knew what it took to create a good one, and we were passionate about the integrity of the game, and providing that positive environment for their daughters. We decided that if we lost kids because of it, that we were more than fine with it. The integrity of what we were doing was more important than the paycheck. From a soccer standpoint, we have been teaching a possession, skills based, style of soccer, and we have committed to stick with it, even if it means losing games. This isn’t about our egos, or feeling like we are getting some kind of legitimacy for U10’s winning games, it is about pushing the girls to become better and doing what it takes to get there. So with 2 weeks of practice under our belt, we departed for our first ever tournament, the Seaside Classic in Rhode Island. For the U10’s, they played 6 v 6–we had a range of 7-10 year olds, and we evenly split up the U10’s into 3 teams, and put them in the hardest group for U10, although many were playing 1 or 2, or even 3 years up. We did the same for the U12’s (2 teams in 8v8) and had another team playing 11 v 11 at the U14 level. 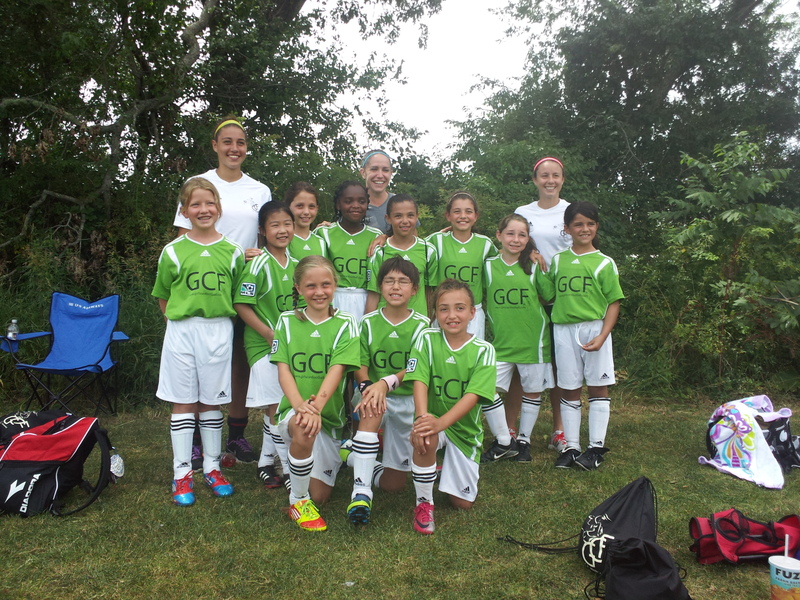 I coached the U10’s, because I just love them at that age. They are sponges. And as a coach, nothing gives me a bigger high than challenging myself to teach them proper technique without putting barriers because of their age and watching them master it. And some of my most impressive performances this weekend came from my 7 year olds, often playing fearlessly against kids double their size. We had some good results, but in many games, my little U10’s got pummelled. Not because the other team was playing fantastic soccer (although I was very impressed with a couple of groups), but for the most part because it was typical youth soccer of hammer the ball up the field to the fast kid, who overpowers everyone and scores. I’m not going to lie, there were times, that there was a coach on the other sideline that was one of those guys that you could tell defined his self-worth in the score of his U10 games. The competitive side of me (and the side that wanted to shut him up) was tempted to cut corners to do what it took to beat him. And I understood clearly why coaches give in and do that. So although I was tempted to cut corners by playing just the best kids, or forcing a kid in goal because they were good at it, not because they wanted to, or just instructing the kids to boot it down the field because we’d have a better chance of scoring, we stuck to the game plan. And after every game, my little 7-10 year old crew and I forgot about the score and reviewed together if we accomplished our team and individual goals. And for the most part they did a fantastic job, and the girls received many compliments about their foot skills and passing from both the opposing coaches and parents. And despite these shellackings that occurred at times throughout the weekend, we did not hear one negative word from the parents. There was an incredibly positive vibe throughout the whole weekend from them, which I think speaks volumes for the group of moms and dads that we are lucky enough to have on this journey. Our U14 team, came out of nowhere and knocked off a team ranked 20th in the country to win the tournament. But the successes of the weekend for all of us came in seeing the growth of the kids, and the positive vibe of the long term journey we are on. I’m still riding the high of a great weekend and can’t wait til the next one. well done coach, create the environment and the rest will follow. Can you move to Southern California? We need coaches like you. You sound like a great coach. I love the high expectations you have for your girls, yet there is an emphasis on development, rather than winning. Can’t wait to here more about your team’s season. thanks a ton. glad you enjoyed it.